The Hawking HAI8DD has been discontinued. No direct replacement is available. Hawking Technology's HAI8DD, 2.4GHz Hi-Gain Wi-Fi Dish Antenna increases your wireless network strength from a standard 2dBi to 8dBi. A large problem with many wireless networks is poor wireless coverage. The HAI8DD is an easy to install solution that plugs directly into your wireless device via the antenna port. 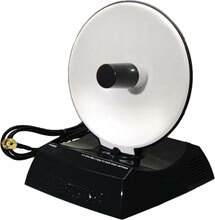 New advacned Wi-Fi Dish antenna technology gathers and directs the wireless signal towards the wireless source. As a result, the HAI8DD improves the distance and connection quality of your Wi-Fi by up to 350%.